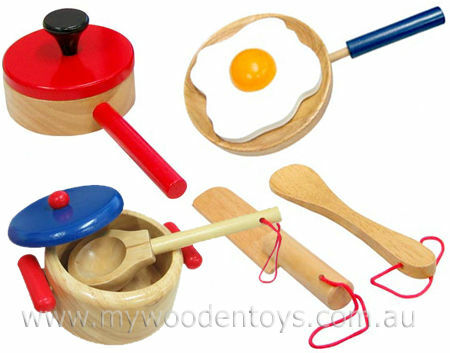 This set contains 9 pieces, a saucepan with red lid, a pot with blue lid and a frying pan, complete with wooden frying egg. There are also 3 utensils, a ladle for your soup dishes a knife, and a spatula to flip things in the fry pan. Size: The Fry pan has a 12.5cm diameter and a 9cm long handle. The Sauce pan has a 9.5cm diameter is 3.5cm deep and has a 10cm handle and the Pot has a 10cm diameter and is 6.5cm deep. The utensils are 16cm long. The egg is 11cm by 11cm. We like this because: "Its solid well made and has a large wooden egg that our daughter thinks is funny."